IT WOULD be great if playing position off a ball sitting in the jaws of the pocket was easy as it looks, but it isn't. I've always said that I would rather have a ball a foot away from a pocket than right up next to it. When you have a little distance between the pocket and the object ball, you know exactly where you need to hit the object ball to make the shot. You are limited to one contact point, which allows you to focus on the path of the cue ball. When you have a ball hanging in the pocket, however, you have to choose where on the object ball you want the cue ball to hit. Just about any contact with the object ball will send it into the pocket, so you have multiple options. When you are playing position off a ball hanging in the pocket, choose an exact point on the object ball. This will help you see the cue ball's path toward position for your next shot. When I started really working on my position play, I practiced cutting the hanging object ball into pieces. I would practice hitting a certain fraction of the object ball (going from 1/8-ball to full). By doing this, I saw how different the cue ball's path was from each hit. Also, by hitting different portions of the object ball, I could see how a quarter-ball hit was different from a half-ball hit. In Diagram 1, I've set up a basic drill to help you get a feel for playing position in these situations. Start with the cue ball at C-1. 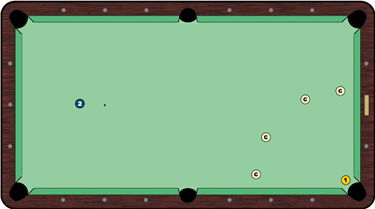 Hitting the cue ball in the center, try to pocket the 1 ball and leave the cue ball near the X. Vary your contact point on the 1 until you are consistently getting position on the 2 ball. Once you can do that, move the cue ball to another spot and start over. You should quickly learn how the contact point on the 1 ball is very, very important. Another important point: When you are working on hitting different fractions of the object ball, it is important to use the same spin on the cue ball with every stroke. Keep it simple to start by hitting the center of the cue ball.